Justice Minister Ayelet Shaked says difficulty in solving issue of illegal infiltrators shows need to enact law bypassing Supreme Court. 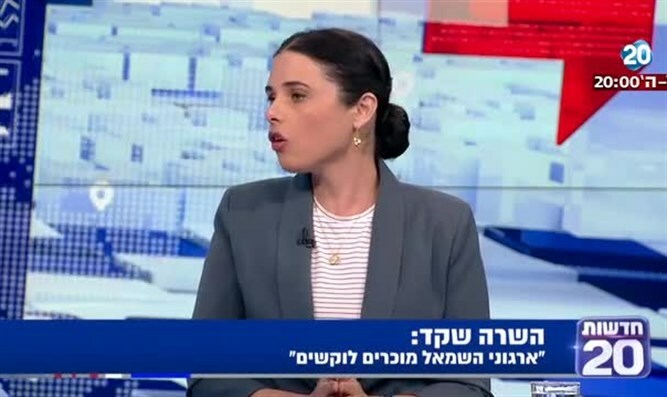 Justice Minister Ayelet Shaked says that the problem of the illegal infiltrators presents a golden opportunity to pass a law to restore the legislative powers of the Knesset which she she believes have been usurped by the Supreme Court. In an interview with Channel 20, the minister said, "We think that this is an opportunity to enact the passage of the Basic Law: Human Dignity and Liberty, and then to re-enact the Prevention of Infiltration Law more effectively." "This is our proposal. We want to suggest that the party heads convene the Ministerial Committee on Legislation next week. I am the chair and can convene the committee, pass the law on to a ministerial committee, pass it on in a preliminary reading and thereby begin the legislative process. When asked how the government intends to solve the problem of the illegal infiltrators, Shaked answered, "With determination. There are several options and possibilities, and the government, I estimate, will begin to implement them. First, as the Prime Minister said, we intend to continue reaching out to other African countries - not the published country, but other countries, safe countries. States that the Government of Israel have determined are safe and where there is no fear or danger in reaching them so that the implementation of the plan will continue. She described her shock at the announcement of a deal with the UN to allow 16,250 illegal infiltrators to remain in Israel. "I did not conduct any negotiations with the head of the NSC. The negotiations were led by the head of the NSC. I did not even know that the outline agreement was signed. Yes, I knew about the negotiations, and I knew about the general idea. My office staff provides legal counsel to all the government ministries and to every minister in his field, and so they were involved to some extent, but that was not part of the work on my desk." Netanyahu eventually cancelled the deal. The minister added that the current situation in which new infiltrators are unable to reach Israel should be maintained. "You have to remember that new infiltrators have not come here for the past year and a half for three reasons: Firstly, certainly the fence, secondly, because they are not motivated, because of the law that does not allow them to work for a year and three months - because of which they are not motivated to come. [And thirdly] because it is difficult to pass through the Sinai today. It is necessary to maintain this situation so that they will not be motivated to arrive and we must also allow them to be transferred to retention facilities for longer stays. "